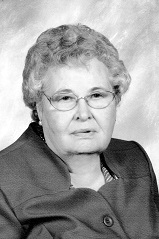 Bonnie Potter, 87, of Abilene, Texas, passed away on January 15, 2016 in Abilene. Visitation will be 6:00 PM to 8:00 PM, Monday, January 18, 2016, at The Hamil Family Funeral Home, 6449 Buffalo Gap Road, Abilene. Funeral services will be held 3:00 PM, Tuesday, January 19, 2016, at The Hamil Family Chapel with the Rev. Ronnie Newton officiating. Burial will follow at Elmwood Memorial Park. Bonnie Hughes was born in Frisco, TX, to Jesse P. and Josie (Simpson) Hughes on July 16, 1928. She went to school and graduated from Bradshaw High School. She married Willie G. (Bill) Potter on August 24, 1946, in Callahan County, TX. She was a homemaker. She was a member of Elmcrest Baptist Church at the time of her death. Bonnie was preceded in death by her husband, Bill Potter; one sister, Jesse Sterling; and three grandchildren, Randy Lee Potter, Trey Bird, and Joshua Brandon Bird. Bonnie is survived by four children, Randy Potter (Betty) of Snyder, Donna Bird (Larry) and Barbara Stewart of Tye, and Karen Owens (Mike) of Wichita Falls. She is also survived by 9 grandchildren, Jeffrey Potter (Stephanie), Brian Potter (Michelle), Joel Bird (LaDonna), Kim Sherrod (Joe), Kelly Truman (Casey), Greg Abell (Vicky), Michael Owens, Jason Owens, and Joseph Owens; as well as numerous great grandchildren, two great-great grandchildren and her good friend Sylvia Robbins. Pallbearers will be grandsons Jeffrey Potter, Brian Potter, Joe Sherrod, Joel Bird, and great-grandsons Mathew Potter and Stephen Potter. Memorials may be given to the charity of your choice . Online condolences may be made at www.hamilfamilyfuneralhome.com. Arrangements are under the direction of The Hamil Family Funeral Home, 6449 Buffalo Gap Road, Abilene.